Rather than products that get worse and worse as they are used, cast iron frying pans keep getting better. 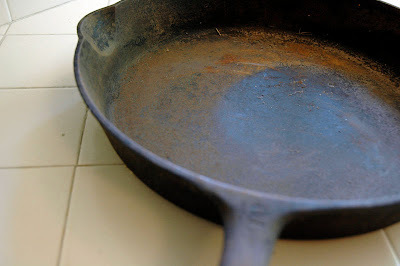 Though not perfectly non-stick like off-gassing, toxic teflon pans, the cast iron is seasoned over time to create a mirror-like finish that works just as well with only a smidge of olive oil. Lodge is the last foundry in the US that is still making cast iron cookware. 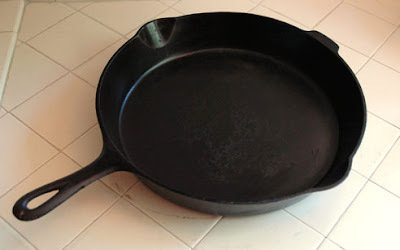 As we believe in practical heirlooms, I am proud to sell Lodge cast iron at Coco's Variety. Why buy domestic cast iron? Well, Lodge is a family owned concern that is over 100 years old and uses recycled iron to create their pans. As opposed to imports from China or India, Lodge passes all the raw iron through a radiation detector to assure they are not creating hot pans that will set off your Geiger counter. Seasoning a cast iron pan is neither difficult nor complicated. The Lodge pans are pre-seasoned, but the old cast iron will need to be reseasoned if it has been neglected like my aforementioned Griswold 12. If there is interest, I will document the seasoning process as I took photos of the above transformation.